Happy Habanero Christmas, to all you crazy, wacky, Chileheads. Have you done your shopping yet? I have a great Christmas idea. 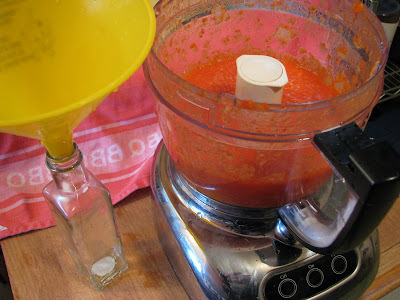 Why not make some home made hot sauce for your friends and family? You could even give some to your boss who is hot sauce challenged. Who ever you make this gift for it will be received with gratitude and admiration that you have taken the time to give a gift from the heart/kitchen. 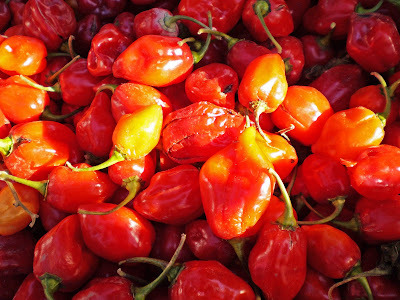 While shopping at the Alemany Farmers market, a booth with some beautiful red habaneros grabbed my eye. They were three dollars a pound. That is very cheap. A pound of habaneros will go a long way. This is when the light bulb went off. Let’s make some hot sauce. We rushed home as fast as the bumper to bumper traffic would take us. It is the Bay Area you know. Once home the Habeneros were washed. We then cut the stem and halved them. A word of caution, I know you have heard this before. Wear gloves or suffer. I have worked with peppers before and was pretty confident of not getting burned. I washed my hands with frequency. This is not enough. Some how I got a little capsicum oil on my face and eventually it made it to my naughty parts. How it got there is a mystery. It was not fun! 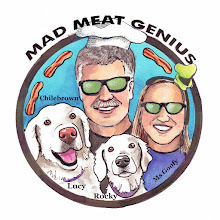 Let’s get back to the cooking. 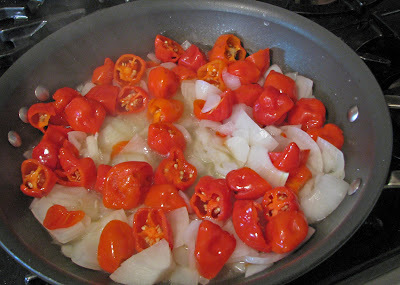 The peppers were put in a non stick pan with a coarsely chopped onion. A splash of vinegar, water and a little sea salt was the whole ticket. This mixture was simmered for 15 minutes. After the mixture was cool it was placed in a food processor. I blended this Holiday mixture until it was a smooth puree. Some cider vinegar and water was added to thin this mixture down. Another warning should be heeded. Hide the children and pets. This mixture when blending is highly abrasive to the eyes and nostrils. What we do to make Hot Sauce is challenging. It then was funneled into clean hot sauce jars. This was some great tasting sauce. 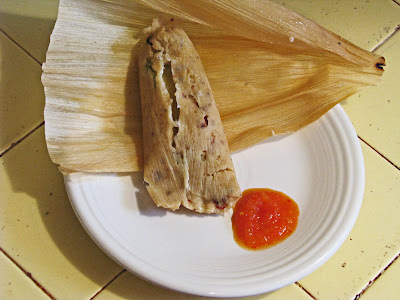 The taste test was with a bacon tamale. 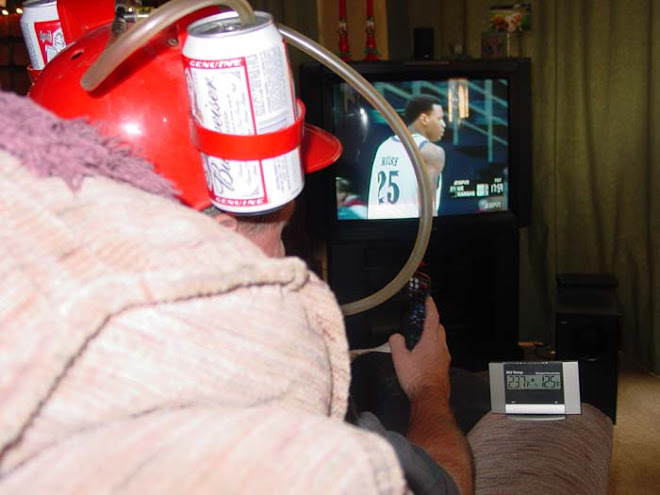 The heat level is in outer space. It is one of the hottest sauces I have tasted that did not have extract. I was pretty darn proud. Once the fire went down the true fruity habanero flavor shined through. The cider vinegar really rounded the flavor. 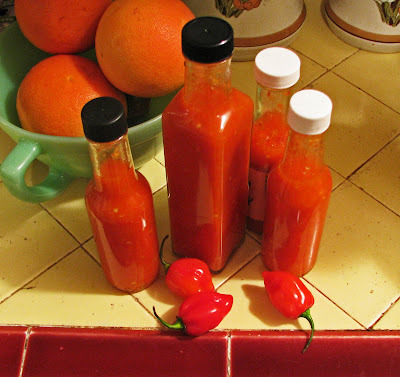 Give a gift of Love and make some hot sauce. "Merry Habanero Christmas!" I am the recipient of this sauce and I have to say it was top-notch. Sure it had the heat, but the fruity flavors of the pepper were outstanding. LOVE the sauce. What a great idea! And nice and warm for the holidays. Thank you! highlandsranchfoodie, Do not be afraid! I am a native from Oakland,have Silver & Black blood, and had season tickets for 12 years. There will be no love for those mangy, nag, excuse for the equine species,Broncos. Doctor B. You are the Master. You are a chilehead and you hate the donkeys. Greg, We are brothers in Black Iron. I have a feeling somebody went to Cabela's for some Christmas gift cookin utensils. I cannot wait. Nice looking sauce! My supply of Marie Sharp's Habanero sauce is running low. I might need to give this one a try. Thanks for sharing.